MorphVOX Mac voice changing software can be used with all online games including World of Warcraft, EVE Online, Second Life, Lord of the Rings Online and many more. It also integrates with VoIP and Instant Messaging programs such as Skype, Ventrilo, TeamSpeak, Yahoo Messenger,GoogleTalk and more. 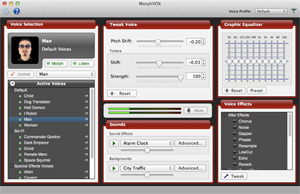 In the studio, MorphVOX integrates with multimedia applications such as Sound Forge, Audacity and much more. Many features under the hood. The clean and simple user-interface make this voice changing software so easy to use. Take voice changing to a new level. 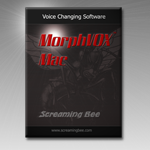 Change your voice today with MorphVOX Mac. Download the software today!